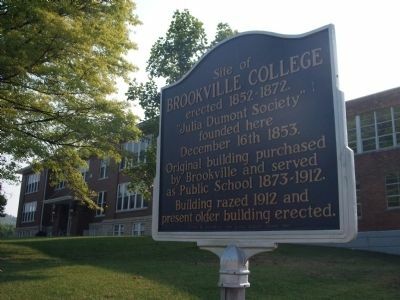 Site of Brookville College erected 1852 - - 1872. “Julia Dumont Society” founded here December 16th 1853. 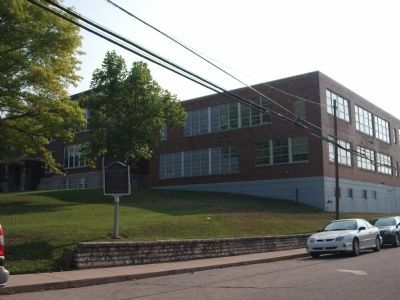 Original building purchased by Brookville and served as Public School 1873 - - 1912. Building razed 1912 and present older building erected. Erected 1963 by Brookville High School Student Council. Location. 39° 25.525′ N, 85° 0.654′ W. Marker is in Brookville, Indiana, in Franklin County. Marker is on East 10th Street east of Franklin Avenue, on the left when traveling east. Touch for map. Located on the South/West lawn of the 'Franklin County School Administration' building. Marker is in this post office area: Brookville IN 47012, United States of America. Touch for directions. (about 700 feet away); Goodwin Home (approx. 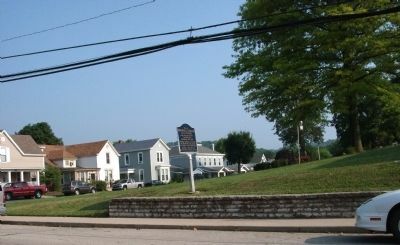 0.2 miles away); Brookville Historic District (approx. 0.4 miles away); The Courthouse Square (approx. 0.4 miles away). Touch for a list and map of all markers in Brookville. More. 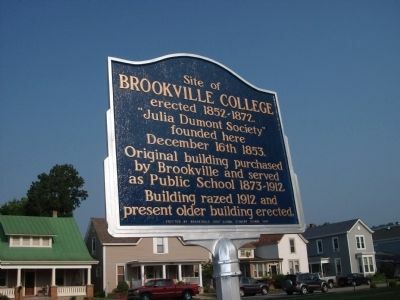 Search the internet for Brookville College. Credits. This page was last revised on June 16, 2016. This page originally submitted on July 18, 2011, by Al Wolf of Veedersburg, Indiana. This page has been viewed 459 times since then and 5 times this year. Photos: 1, 2, 3, 4. submitted on July 18, 2011, by Al Wolf of Veedersburg, Indiana. • Bill Pfingsten was the editor who published this page.